Will other makers follow with muscle diesels? BMW's new M5 will soon get a diesel-powered companion, this one using a triple-turbo diesel, the first oil-burner to bear the vaunted "M" badge. Editor’s note: The following story has been revised to make clear that BMW M Manager Brian Watts did not himself confirm the diesel program has been approved but is only under consideration. However, ranking BMW sources have repeated their confirmation that what is tentatively being called the BMW 550dXM will be publicly revealed in spring 2012. BMW will introduce a new high-performance diesel-powered 5-Series model next spring that will expand the German maker’s vaunted M division, TheDetroitBureau.com has confirmed, with the triple-turbo V-8 oil-burner set to also be used in a variety of other BMW products, likely including its X-series sport-activity vehicles. Rumors of the diesel M have been circulating for several weeks, but TheDetroitBureau.com has confirmed details with a variety of BMW sources who say the maker wants to prove out the potential of the high-mileage technology – taking advantage of a variety of new technologies, including the unusual triple-turbocharging system meant to eliminate even the most minor turbo lag. The new model is likely to get the unusual designation of either BMW 550dM or 550dXM, the latter referring to its all-wheel-drive system. With rare exception, most models produced by the Bavarian maker’s performance sub-brand flash the vaunted “M” first and foremost. But the alternative nomenclature would reflect the unusual powertrain under the hood of the 5-Series BMW. The 3.0-liter straight-six diesel will use a small turbo to instantly build boost for launch, two larger twin-scroll turbochargers then spooling up for higher-speed performance. The basic engine is the same as the current BMW 3.0-liter diesel but with significant modifications, including a new cylinder head. It will make use of a variety of advanced technologies, including direct injection and BMW’s Valvetronic system, designed to optimize the function of intake and exhaust engine valves. 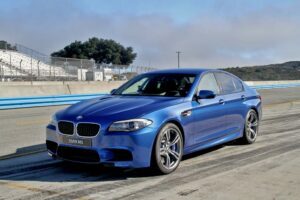 Sources tell TheDetroitBureau.com that the 550dM will deliver slightly less horsepower than the new gas-powered BMW M5, which makes 560 ponies. Final numbers will likely be in the 500 to 550 range. 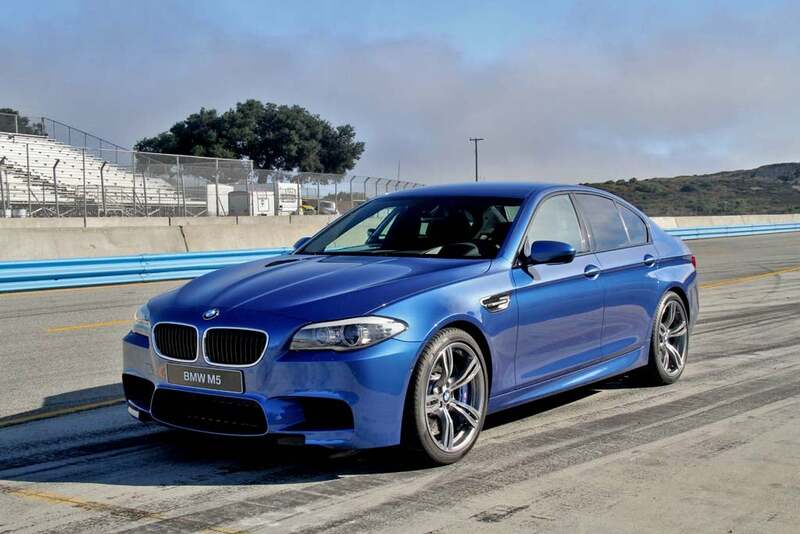 Torque, meanwhile, will well exceed the 500 lb-ft of the new M5, and could push north of 650 lb-ft. While several makers have demonstrated the potential for diesel power on the track, the move to put it into a high-performance street car is a significant breakthrough. Mercedes-Benz briefly offered a diesel model wearing its AMG badge but that lasted only a year on the market. BMW has long considered the option but it took several significant developments for the company’s comfort level to reach the necessary threshold. “Diesel technology has come a long way in the last five years,” said one BMW executive, adding that the maker also had to be certain buyers would be able to get the necessary quality of diesel fuel in any market – notably including the U.S. – where the 550dM will be sold. For the record, M brand global marketing manager Brian Watts confirmed only that the maker is looking at a diesel M car because it “certainly has some interesting potential.” He stressed that the review is “not finished.” But other insiders said only the final details, such as performance specifications – and the final brand nomenclature – have yet to be firmed up, with the new diesel muscle car due for a reveal next spring, very likely with an unveiling at a major auto show like the Geneva Motor Show. The engine is intended to find applications beyond the 5-series M edition, sources agree. It is designed to fit in a variety of additional BMW products and would most likely show up next in one or more of the maker’s X-Series Sport-Activity Vehicles, such as the X5 or X6. But a version of the 550d engine might also be melded with the maker’s flagship 7-Series sedan “a year or more later,” said a source. BMW officials say they hope to steal a march on competitors – but, said one, “I expect to see others follow,” a reference to both Mercedes and Audi. The executive said he was particularly surprised that the latter German brand had not moved into the diesel performance segment more quickly, as it would play off Audi’s link to diesel power. The maker has dominated the Le Mans endurance series for much of the past decade with its various diesel-powered race cars. This entry was posted on Wednesday, August 17th, 2011 at and is filed under Automobiles. You can follow any responses to this entry through the RSS 2.0 feed. Both comments and pings are currently closed. There’s 1 turbo for each bank, and the third turbo is an electric turbo, meaning it can be mounted anywhere, since it doesnt need exhaust gases to operate.